The Complete Works of Sister Nivedita. Sister Nivedita was a devotee of Swami Vivekananda. 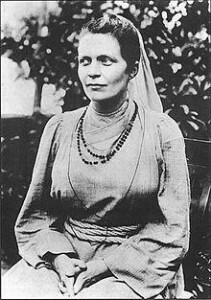 She had Scots-Irish origins and came til India as a social worker in 1898 where she met Swami Vivekananda who gave her the name Nivedita (meaning “Dedicated to God”). She became close with Vivekananda and also with Sarada Devi, the spiritual consort of the mystic Ramakrishna and one of the major influences behind Ramakrishna Mission and also with other brother disciples of Swami Vivekananda. She died on 13 October 1911 in Darjeeling. During her stay in India she wrote 12 books on different topics from dharma and education to politics, but all of them referring to Hinduism and mysticism. All her books and other writings are here collected in the five-volume collected works. Sister Nivedita wrote 12 books on different topics from dharma and education to politics, but all of them referring to Hinduism and mysticism. All her books and other writings are here collected in the five-volume collected works. But isn’t here a list around, where to see all downloadable texts, e.g. about Zen, Christianity. I would like to thank the entire team for providing the full works of Swami Vivekananda in such a easy way. Dear Ranu, thanks for your kind words. – You are welcome. the book is very interesting.thank you PDF!!! Thank you for your effort. I think many people do not know about the work of Sister Nivedita. Hope this will enlighten them about Sister Nivedita and her works. Thank you for bringing out such hard to find jewel of books in such format that would have been enexplored otherwise. Thank Mr. Please let me know if you have any special requests for books.